A many-domed wooden church stands in a field of snow. It is a quintessentially Russian image, one that goes beyond stereotypes to deep cultural and spiritual roots. More than a decade ago, architectural photographer Richard Davies found some old postcards of wooden churches by Ivan Bilibin , a Russian artist famous for his fairy-tale illustrations. In 1902, Bilibin had made the first of three trips to explore the folklore-rich Russian North and record his findings. Exactly a hundred years later, Davies set off to follow in his footsteps. His journeys would span nine years and many thousands of miles. For Davies, his journeys through the Russian North were “pure pleasure,” something that occupied most of his spare time and money. “Instead of going to the beach or going skiing,” he told RBTH in a recent interview, “I went to Russia … that was where I wanted to be.” There were “no difficult moments,” Davies said, “but several funny ones,” including a brief run-in with local security services where he ended up sympathising with officers who had to fill out handwritten forms in triplicate. Since Soviet times, a series of outdoor museums have preserved examples of this architecture. For Davies, they provide a useful introduction, but “the churches were built for locations … you can see a lion in the zoo, but it looks even better in the wild.” For those travellers who want to attempt their own church-safari, Davies recommends starting in Kargopol , with its 17th century stone churches, and then following the Onega River towards the White Sea. Davies, who has worked with many top architects including Norman Foster said he is not a Russian expert, but “a simple jobbing photographer.” He jokes that a lifelong interest in Russia began with “head banging to Prokofiev while my friends were head banging to the Rolling Stones. 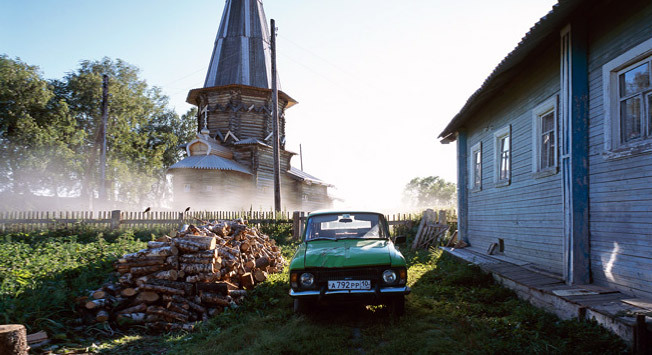 You can buy 'Wooden Churches: Travelling in the Russian North' from Amazon.com . You can also buy it in several european and american bookshops, listed here . Ecclesiastical architecture is closely connected with Russian art, from icons to Vasily Kandinsky and beyond, via well-loved landscapes like Isaak Levitan’s “Above Eternal Peace,” with its isolated wooden church. The book features these and literary quotations, from Leo Tolstoy’s “Resurrection” to Vladimir Mayakovsky’s iconoclastic poetry, becomimg, in effect, a journey through Russian culture as well as an extraordinary travelogue. The original version of this text advised our readers to visit an ensemble of two churches and a bell tower in a village of Lyadiny. Unfortunately on May 5, 2013 the ensemble of churches at Lyadiny caught fire and several of the buildings burned to the ground. Firefighters managed to save the Church of the Epiphany, but were unable to preserve the Church of the Intercession of the Holy Virgin and the adjacent bell tower. Russia Beyond the Headlines apologizes for this mistake. You can read more about the beautiful architecture of Lyadiny at William Brumfield’s article.